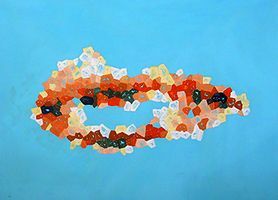 Frank Stellabotte, “Lips1,” oil, 24 x 36 inches, February 2001. Reception on Wednesday, March 27, 4:30-7pm Frank Stellabotte’s abstract imagery evolves out of observations made through microscopes. Organic materials transformed by profoundly magnified perspectives are reimagined as colorfully evocative forms and pattern rich compositions. These works seek to inspire associative discovery and expand perception beyond the constraints of subject matter alone. Stellabotte began painting in the 1980s yet later at Trinity College his work was influenced by experiments with electron microscopes. His work has been displayed at the Lyman Allyn Art Museum, Manchester Community College, and the New York Hall of Science. He is currently an Assistant Professor in the School of Allied Health, Business and STEM at Middlesex Community College in Middletown, CT. Prior to that, he completed two postdoctoral fellowships at the University of Southern California and the House Research Institute of Los Angeles. He earned a Ph.D. in Biology from Wesleyan University with concentrations in genetics and developmental biology; and, a B.S. in Biochemistry from Trinity College. Pegasus Gallery is located within the library on the first floor of Chapman Hall Hours: Monday - Thursday 8 a.m.-8 p.m., Friday 8 a.m.-4:00 p.m., Saturday 4/6 10am-4pm.